Since we had smoked salmon on hand, we put it on an artisan flatbread that we also had left over. We toasted the flatbread, then smeared with labne, sprinkled with capers and shallots and spread with smoked salmon. Delicious. Add 25c for labne, shallot and capers. Lunch today was generous and delicious for $4.25 per serve. 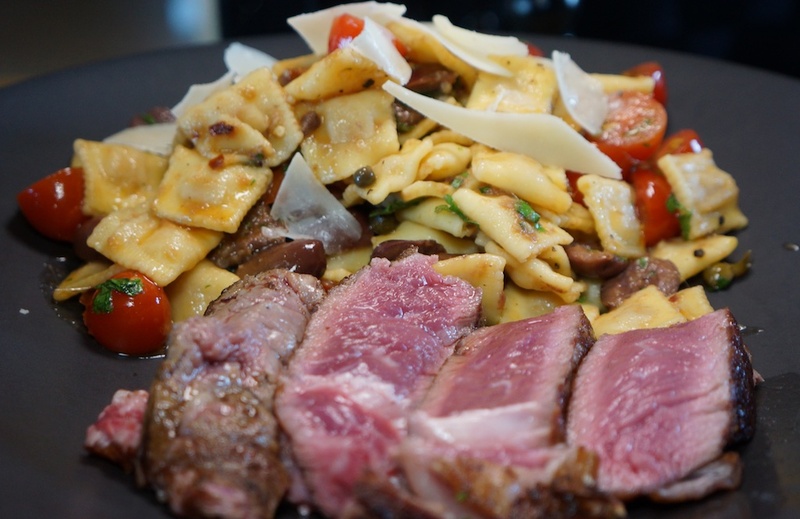 Foodie Greg had the idea of converting the puttanesca pasta into a warm salad as a side for ‘Thursday night steak night.’ Tonight’s steak was a rib eye from our Prather Ranch delivery. The salad worked well, although we were a little heavy handed with the anchovies, so it was a little salty by itself, but with the unseasoned steak, it balanced nicely. The baby ravioli, from Trader Joes, were pretty boring. The organic baby plum tomatoes were $2.79 for the pack, and we used the second half, or 70c per serve. Add 20c for garlic, oil and seasoning. Tonights steak was – as always – extremely tender, which is why we eat it blue: uncooked inside, with a good crust seared on the outside. The pasta salad was flavorsome, and a good match for the steak. All in tonight’s meal cost $12.69 per serve. 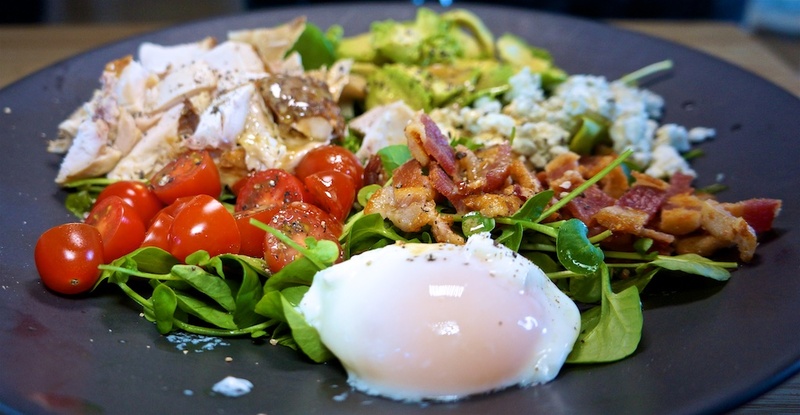 It’s been a while, and the weather is warm, so what better than a Cobb Salad? The egg was supposed to be hard boiled, but it turns out a coddled egg is perfect on a Cobb. The organic baby plum tomatoes were $2.79 for the pack, but we only used half, or 70c per serve. Tonight’s Cobb Salad cost $4.68 per serve. Lunch today cost $2.38 per serve. A simple meal: the legs and thighs from the roast chicken, with a rice pilaf featuring red lentils. Rice and red lentils add another 60c per serve. Dinner tonight was serviceable but cheap at $2.35 per serve. Philip was in Burbank – as is common on a Monday – and had his usual Double Double at In and Out, while Greg had a serve of the fish pie. The fish pie is $4.47 a serve, while the Double Double is $4.08 or an average of $4.27 per serve. 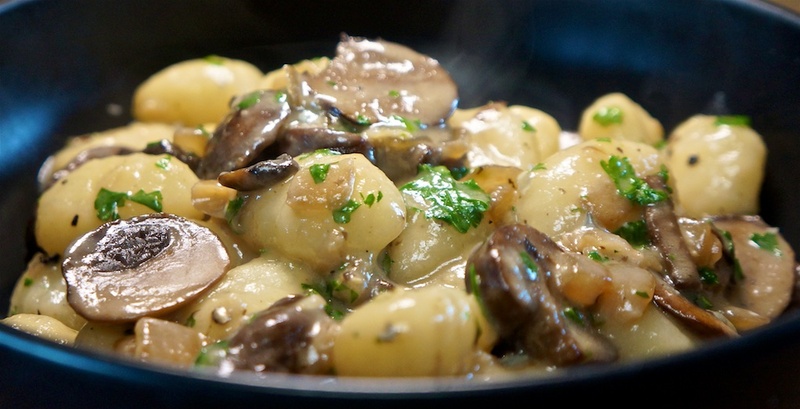 A new recipe for us, Gnocchi with mushrooms & blue cheese, we made half the recipe, with blue Castello as the cheese of choice. We also added a little pasta water to help the cheese become a sauce, even though it’s not in the recipe. Add 30c for butter, mushrooms and spices. Another perfect day, another BLT, but this time on a par baked rustic roll. Lunch today cost $2.78 and was pretty good. Sunday night seems to be trending as “pot roast night.” Tonight a new recipe from Emeril, which features garlic, as you expect. 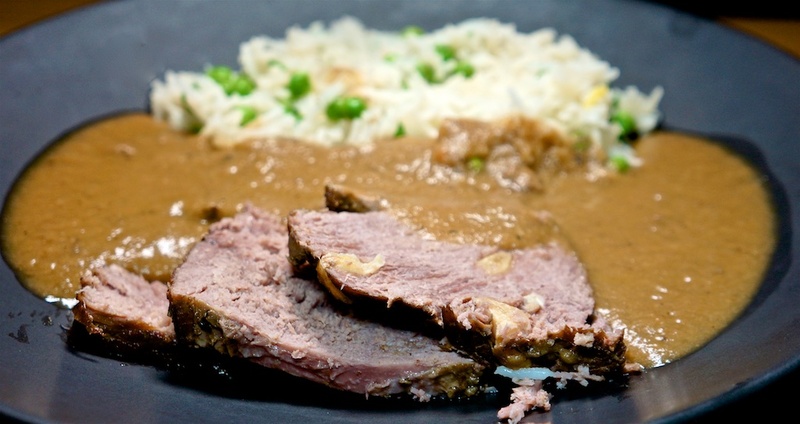 With the addition of a little horseradish and worcestershire to the blended ‘gravy’ elevated this to “really good.” Although Emeril says the dish serves six, we got three and a half generous serves, say three. The pilaf – rice and onion – runs 63c per serve. Tonight’s excellent dinner cost $8.65 per serve. With four huge new gardens completed, it was time to choose some plants – cactus and other succulents – and, since the nursery is on the way back from The Country Deli, we stopped in there for lunch before getting to work. Hearty lunches all round for $21.50 per serve, with tax and tip. We returned to the fish pie and took out another two serves at $4.47 each. A perfect day for a BLT on a fresh baguette. Lunch today cost $2.83 and was pretty good. Being fans of the Two Fat Ladies a natural choice was Jenifer’s Fish Pie, but with a few variations. We left out the shrimp and chose smoked salmon belly for a smoked fish, and cod for white fish. Instead of potato we used a cauliflower mash topping. The recipe seems to make six serves. 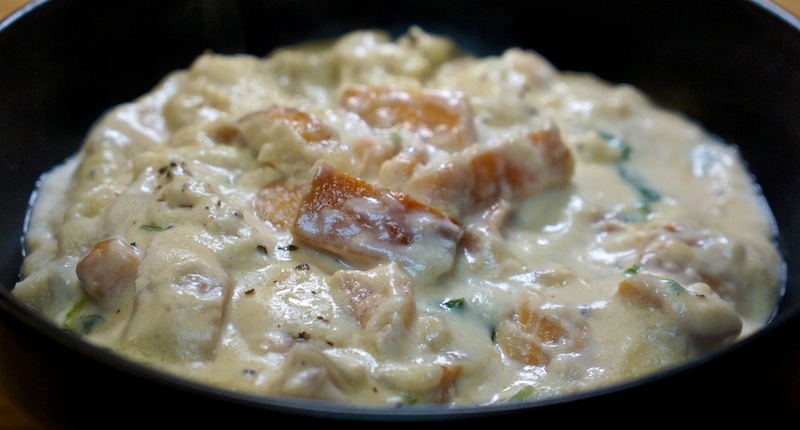 For the firm fleshed fish, Greg used Kroger Wild Caught Pacific Cod. The 40 oz pack costs $16.89 but only 8 oz was used (two filets) or 56c a serve. Butter and seasonings add another 44c per serve. Tonight’s dinner cost us $4.47 a serve. Since it lacks all structural integrity, it’s hard to understand why this is a “pie” when it’s more of a fish stew. We felt it could use a little more heat, like curry. Oh wait, that would be kedgeree! Since we had smoked salmon on hand, we put it on an artisan flatbread, which we’d toasted, then smeared with labne, sprinkled with capers and shallots and spread with smoked salmon. Delicious. A classic “Thursday night, steak night” meal: rare rib eye with Caesar salad. Instead of croutons and cheese we used Trader Joe’s Oven Baked Cheese Bites which worked extremely well, for $1.25 per serve. Tonight’s steakhouse quality meal was $13.19 per serve. The steak was exceptionally tender with a great beef flavor and the dressing is about the best Caesar salad dressing we’ve had, especially since we added a little more garlic than the recipe called for. For lunch we reheated and finished the Popeye’s Chicken from yesterday, paired with a butternut squash, red quinoa salad from Trader Joe’s. The salad was $3.99 or $2.00 per serve. LACPUG meeting night followed by pizza where we contribute $5.00 per person to cover expenses. Foodie Philip was in Burbank in the middle of the day, so the Tuesday special at Popeyes called. Half the Large Red Beans and Rice is $2.19 with tax, per serve. Lunch today cost $4.14 per serve. For a period we had congee quite regularly then we got tired of it, as happens, but after more than a year, it was time to give it another go with Brown Rice Congee with Shiitake Mushrooms and Greens. We substituted the remaining bok choy for the greens, and opted for a poached egg(s). Eggs add an average of 75c per serve. Dinner tonight was very satisfying with good flavor, and cost $4.50 per serve.